Diese Möglichkeit gibt es seit GIMP-2.8. You can group layers that have similarities in a tree-like way. So, the layer list becomes easier to manage. through Layer → New Layer Group, or through the layer dialog context menu. This empty layer group appears just above the current layer. It is important to give it an evocative name (double-click or F2 on the name, or use Edit Layer Attributes in the context menu you get by right clicking the Layer dialog, to edit it), else you will get confused when several ones are created. You can create several layer groups and you can embbed them, that is include a layer group in another one. You can add existing layers to a layer group by click-and-dragging them. The hand representing the mouse pointer must turn smaller before releasing the mouse button. A thin horizontal line marks where the layer will be laid down. To add a new layer to the current layer group, click on the Create a new layer at the bottom of the layer dialog, or use the New Layer command in the image menu. 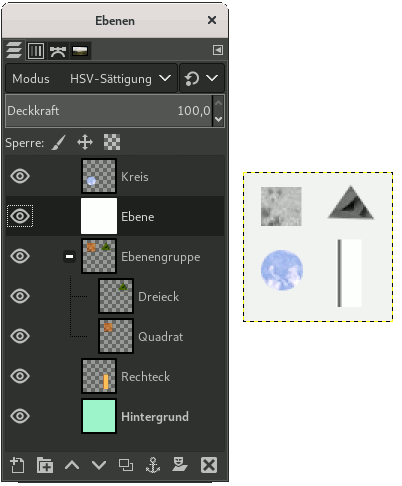 When a layer group is not empty, a small „>“ icon appears. By clicking on it, you can fold/unfold the layer list. Layers that belong to a layer group are slightly indented to the right, allowing you know easily which layers are part of the group. If a layer group is made invisible using the eye icon but still open (so that the layers inside the group are shown in the list), there is a struck out eye shown besides the layers that are inside the group to indicate that these layers are not displayed in the final projection of the image, but theoretically visible in the layer group. You can raise and lower layer groups in the layer dialog as you do with normal layers: click-and-dragging, using arrow up and down keys at the bottom of the layer dialog. You can duplicate a layer group: click on the Create a duplicate of the layer button or right-click and select the Duplicate Layer command in the pop up context menu. You can move a layer group to another image by click-and-dragging. You can also copy-paste it using Ctrl-C and Ctrl-V: then, you get a floating selection that you must anchor (anchor button at the bottom of the layer dialog). You can also move a layer group to the canvas: this duplicates the group in the group. Chain all layers in the duplicated layer group, activate the Move tool, then, in the image, move the layer. That's a way to multiply multi-layer objects in an image. To delete a layer group, click on the red cross button at the bottom of the layer dialog or right-click and select Delete layer. When a layer group is activated, you can add another group inside it with the „Add New Layer Group“ command. There seems to be no limit, excepted memory, to the number of embedded layer groups. A layer mode applied to a layer group acts on layers that are in this group only. A layer mode above a layer group acts on all layers underneath, outside and inside the layer groups. We added a white layer in the layer group with saturation mode: only square and triangle are grayed out. We added a white layer out of the layer group with saturation mode: all layers underneath are grayed out, background layer also. 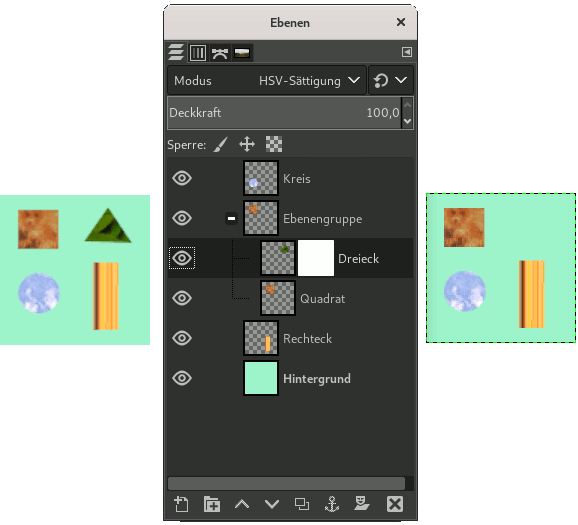 Since GIMP-2.10, layer groups have a special layer mode: the Pass Through mode. This mode exists only if a layer group is active. When this mode is used instead of any other one, layers inside the layer group will behave as if they were a part of the layer stack, not belonging to the group. Layers within the group blend with layers below, inside and outside the group. While with Normal mode, layers within a group are treated as if they were a single layer, which is then blended with other layers below in the stack; a modifier on a layer inside the group blends layers below in the group only. More details about Pass Through in Pass-through . When a layer group is activated, opacity changes are applied to all the layers of the group. 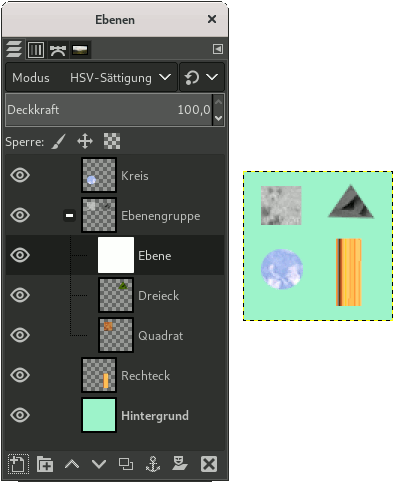 Since GIMP-2.10, masks on layer groups are possible. They work similarly to ordinary-layer masks, with the following considerations. The group’s mask size is the same as group’s size (i.e., the bounding box of its children) at all times. When the group’s size changes, the mask is cropped to the new size — areas of the mask that fall outside of the new bounds are discarded, and newly added areas are filled with black (and hence are transparent by default). We added a white (Full opacity) layer mask to the triangle layer.